Early 20th century. Kisangani. 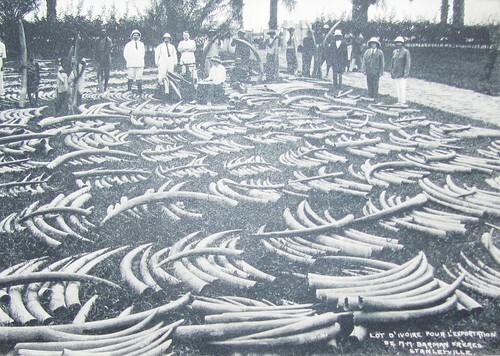 Proud display of Ivory for a single export shipment. 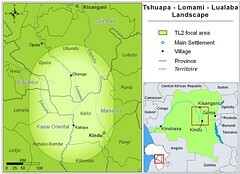 Main source of ivory: the Lomami. It is little consolation that this will never be possible again. Never. Late December 2012. A woman working in her garden by Yosenge exchanges greetings with a small group returning from the forest. They have an AK 47. She knows that means that they were hunting elephants. Her own husband is an expert marksman. If the affair is leaked, her husband will certainly be accused. That evening she reports the gun to the village chief. There is a small remnant-group of elephants – perhaps five, perhaps ten – between the villages of Katopa, Bamanga and the Yosenge path. 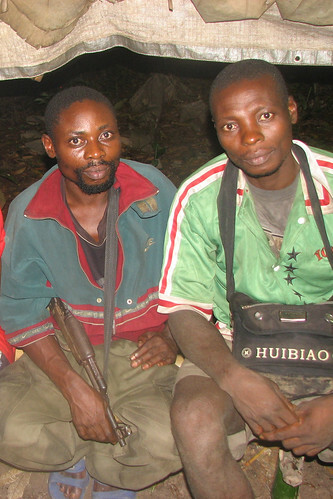 This group is often in the forests around Katopa where we have a base camp and work closely with the village. The elephants are safe near Katopa, even if they destroy some banana plants. The chief takes pride in having rebuffed elephant poachers who wanted to base out of his village. But elephants need more than the forest near Katopa; they follow the ripening of fruit into the forests of Bamanga, Yosenge…and elsewhere. The hunter is from Yosenge, the owner of the rifle from Kindu. They met up in Alumba and then based out of Bamanga. In November, Nyarcos Nyanga, the owner of the gun came to the village of Bamanga with his hunter from Yosenge . Bamanga was their new base. They killed their first elephant in November. They killed a second in early December. They were trying for a third elephant when the Yosenge villager saw them in her garden and sounded the alarm. The chief summoned the hunter. Nyarcos, also in Yosenge, fled immediately to Alumba. Although Yosenge sent a fast runner to Alumba with information to arrest Nyarcos, the chief of Alumba (bribed?) let him sneak out of the village, back to the province of Maniema. Back in Kasai, the province where the killings occurred, six military came from the district capital to find out what happened. They arrested the chief of Alumba and the chief of Bamanga. Each paid one goat. Two goats for two elephants…… that may be the only price to pay. 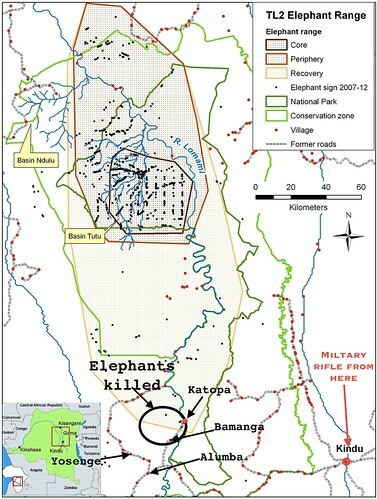 Elephant poachers chased from Katopa several years ago. Was one of these Nyarcos? This entry was written by Terese Hart, posted on 2013-02-10 at 5:57 pm, filed under Elephant, Kindu, Law and Order. Bookmark the permalink. Follow any comments here with the RSS feed for this post. Post a comment or leave a trackback: Trackback URL. So sad. Will this ever end? Thank you young women for exposing the hunting. Thank you Terese for keeping us updated. Thank you Terese for keeping us all informed!